Carbon Assimilation and Modelling of the European Land Surfaces ( CAMELS) is a project funded by European Commission DG Research - Vth Framework Programme. (i) Best estimates and uncertainty bounds for the contemporary and historical land carbon sinks in Europe and elsewhere, isolating the effects of direct land-management. (ii) A prototype carbon cycle data assimilation system (CCDAS) exploiting existing data sources (e.g. 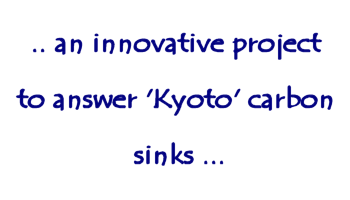 flux measurements, carbon inventory data, satellite products) and the latest terrestrial ecosystem models (TEMs), in order to produce operational estimates of Kyoto sinks. i) Where are the current carbon sources and sinks located on the land and how do European sinks compare with other large continental areas? ii) Why do these sources and sinks exist, i.e. what are the relative contributions of CO2 fertilisation, nitrogen deposition, climate variability, land management and land-use change? iii) How could we make optimal use of existing data sources and the latest models to produce operational estimates of the European land carbon sink? The CAMELS project is carried out by various partner insititues and is coordinated by Hadley Centre for Climate Prediction and Research, Met Office, UK. The findings will be communicated to policymakers to inform EU policy within the UNFCCC.